Aerial lifts are massive and impressive machines that make it possible for workers to keep cities and rural areas running smoothly. They help with repairing utility lines, trimming trees, and maintaining buildings. However, aerial lifts, like cherry pickers and bucket trucks, also contribute to the number of work-related injuries and fatalities in our communities. An average of 26 workers die each year from aerial lifts, and that’s just in the construction industry. 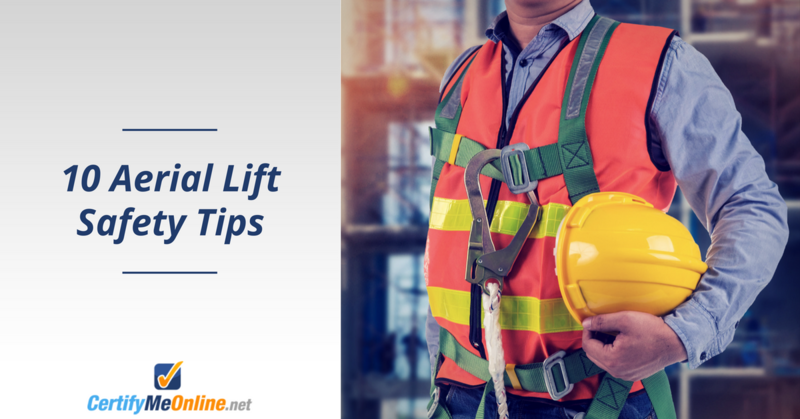 If you work with aerial lifts, you need to know how to prevent accidents with the most important aerial lift safety tips from the experts. There are many hazards associated with aerial lifts that can lead to injuries, damages, and even deaths when operators aren’t sure how to spot them. Electrocutions, tip-overs, and falls from an aerial lift are the top most common accidents involving aerial lifts. When operators don’t understand aerial lift safety tips and haven’t gone through proper training, they aren’t prepared to prevent accidents. When a lift comes into contact with overhead power lines, electrocution accidents are much more likely to happen. Falls from the lift are more likely to occur when an aerial lift isn’t positioned properly and is hit by a vehicle, crane, or other large object. Aerial lift tip overs often happen when the bucket or boom arm breaks, when the bucket falls, or when the lift is positioned on unstable ground. If you want to learn how to avoid these serious accidents, you need to know essential aerial lift safety tips. Check out this page to learn more about the top scissor lift safety hazards and scissor lift safety tips. Proper operator training is the number one most important aerial lift safety tip. The majority of aerial lift accidents are essentially caused by operator error, which means that training can prevent most accidents involving aerial lifts. Make sure that operators are trained in the stabilization and positioning of aerial lifts, along with fall protection. The number one thing OSHA recommends operators do before operating an aerial lift is complete a pre-start inspection. The pre-shift inspection’s purpose is to identify any potential hazards or defects that could affect the safety of the lift. The pre-start inspection should cover both vehicle components and lift components. Read more about the aerial lift safety tips for performing the pre-start inspection here. The manufacturer’s instructions are specific to the make and model of the lift. They detail the weight and height capacities and limitations that should never be exceeded in order to avoid accidents. The aerial lift safety devices are meant to protect workers from pushing the lift past its limits and causing an accident, like a mechanical failure or a tip over. Making sure these are never overridden keeps workers safe. When workers are on the platform while the lift is moving, they are put at risk of falling. This is due to too much weight being on the platform while moving, the bucket or boom breaking, or from something hitting the lift. Many aerial lift accidents happen because the lift was positioned between an overhead structure that came into contact with the lift. Overhead beams, ceiling, signs, and other structures can come into contact with workers in the bucket and crush them when the lift is positioned too close. Choosing to be safe than sorry is one of the most important aerial lift safety tips. When operating near power lines, always keep a distance of at least 10 feet between the lines and the lift and always assume that power lines are energized, even if they are down or insulated. Additionally, workers should always be prepared with protective equipment like rubber gloves, hard hats, and rubber-soled shoes. Fall protection is one of the most important aerial lift safety tips and protocols to follow. OSHA requires aerial lift operators who work at elevated heights wear full body harnesses attached to lanyards that are connected to the boom or basket. These protective tools keep workers from being ejected from the bucket and falling to the ground. Workers must never sit, stand or climb on the guardrails and use them for stability. Fall protection equipment is meant for keeping workers safe and secure. Aerial lifts can become unstable and tip over when placed on unstable or uneven ground. When positioning a lift on an incline, it’s important to set the brakes and use the wheel chocks to prevent the lift from rolling. Workers should also use outriggers when provided. Aerial lifts are incredibly capable machines, but they have limits. Be sure to read the manufacturer’s instructions for the weight and height limitations when handling a load. Remember, the weight limitations of an aerial lift also include the tools and other attachments in the bucket in addition to the workers. Calculating the weight of the lift and tools can take some extra time, but doing so will help to prevent the bucket from breaking, workers from being ejected from the bucket, and the lift from tipping over. Following aerial lift safety tips when operating a cherry picker, bucket truck, telescopic boom lift, or articulating boom lift will help workers avoid common yet preventable accidents that occur every day on worksites. For top quality online aerial lift training that is 100% OSHA-compliant, check out the programs from CertifyMeOnline.net. Training can take as little as one afternoon and be accessed from any device with an internet connection. Complete your training today!